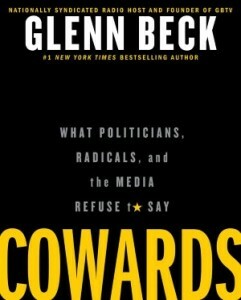 Cowards: What Politicians, Radicals, and the Media Refuse to Say Just in time for the next presidential election the subject of this book is something that seems to be avoided in most of the debates taking place before the election. I am referring to the American people being told nothing but the whole truth regarding the major issues. The sad thing is that the truth is out there, however people do not want to hear it because it usually makes them uncomfortable. The one time Fox News TV show host, Glenn Beck who is the author of Cowards targets thirteen serious issues. These are hot issues that no one else seems to want to tackle due to a variety of reasons. Things such as how having only two parties contesting the elections often results in the Americans not having any good options. Glen also exposes who the real George Soros really is, and his organization the Open Society Institute (OSI). Glenn Beck, currently has a radio show that is syndicated radio and has written many other books in the past couple of years. He has had seven of them hit the #1 position on the New York Times bestsellers list. He is the perfect person to author this book as he is infamous for his defiance of what we call the norm for his whole career. As a result he has often been trashed and called bad names. There are quite a large number of people who do not like him and his views.